How should I dress for that important meeting? What does that word mean in this sentence? Am I still laying the bricks level? How much change do I need to give? Does my model capture the problem effectively? A great deal of our mental activity revolves around solving a variety of problems that have different levels of complexity. We cannot avoid problems as they will find us on our days off, during our holidays and in all forms of work and even play. We have the power to change how we face these problems and how effectively we solve them. While personality can make a difference, here we will be focusing on how people think through and conceptualise issues. Maretha Prinsloo’s holonic model of thinking processes offers a perspective on how cognition works. Holons consist of embedded systems that increase in complexity. They can be described as evolving, self-organising, soft hierarchies where subsequent systems include and transcend previous systems. A nice example of a holon is how living cells eventually form a society. Cells are systems, but cells are included and transcended by organs. Organs are included and transcended by organisms, which are included and transcended by societies. In fact, the universe primarily consists of interrelated holons, which are maintained by a constant exchange of matter, energy and information. Thinking processes and the way they are applied reflect a holonic structure. Memory is the foundation and enables other thinking processes. Memory is included and transcended by other systems of increasing complexity: Exploration, Analysis, Structuring and Transformation. These processes are not applied step-by-step, but simultaneously in an integrated and interactive way. Memory, Exploration, Analysis, Structuring and Transformation are functional processes that are applied purposefully to solve a problem, conceptualise an idea or create a solution. 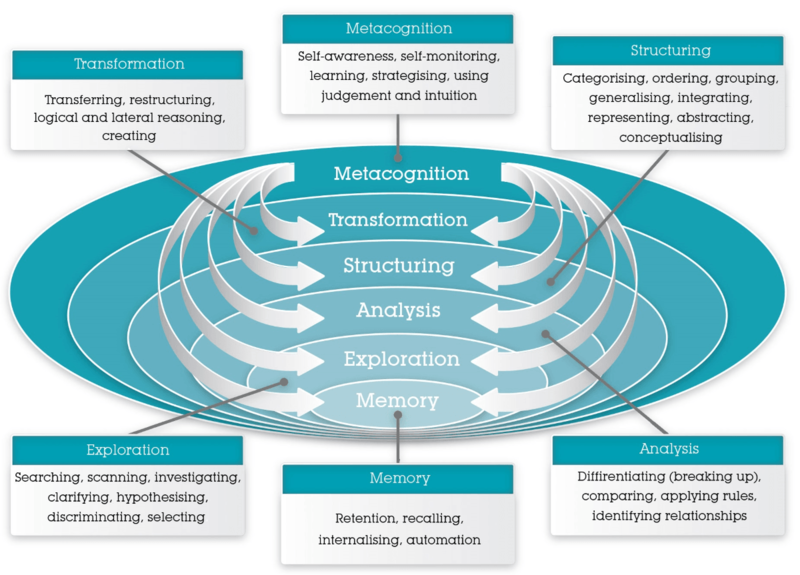 These processes are guided by Metacognition, which can be defined as thinking about thinking, awareness of thinking or questioning one’s own thinking processes. While Metacognition guides thinking, these questions need to arise out of the problem-solving task currently being dealt with. For each of the functional processes, there are associated Metacognitive Criteria. An awareness of these criteria will guide the type of Metacognitive questions asked. To show how these cognitive processes work in practice, imagine someone called John. John is responsible for checking, controlling and fixing a bottle conveyor belt in a factory. Is everything fine, as usual? Do I need to investigate further? What are the core issues here? How is this related to other issues? How can I best represent this information (diagram / flow chart)? What solution is actually required? What are the various options? What solution is most effective? Will this solution create more problems? Where did I go wrong last time? What did I not know? How can I use this information next time? What is my gut feeling about this situation? Metacognitive awareness and the application of Metacognitive Criteria result in improved problem-solving. It includes and transcends all the previous thinking processes. We actually engage naturally in metacognition every day. Metacognition develops as we advance our problem-solving strategies and become self-aware of how we complete certain tasks and our level of skill in resolving issues. Almost all people will use Metacognition while solving a difficult task, but some people use it more or more effectively than others. Metacognition is improved with relative ease and has been linked to intelligence, effective learning and problem-solving. Putting effort into asking yourself these guiding questions may slow thinking down for a while, but eventually it becomes quicker and more automatic. While this article is a simplification of complex theories, hopefully you can start practicing the art of applying Metacognition in your everyday life. The strengths of the theory have been built upon to create a psychometric assessment tool that measures a person’s problem-solving behaviours via a computerised simulation. It is called the Cognitive Process Profile (CPP) and the assessment provides a report that indicates a person’s thinking preferences and capabilities according to the holonic model. 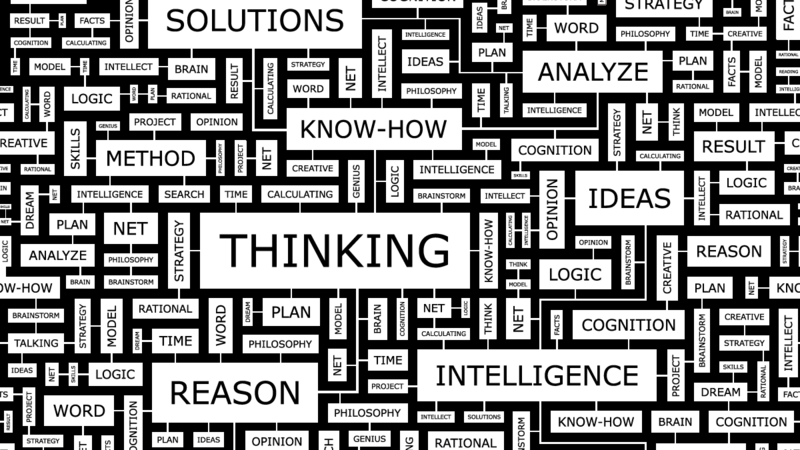 The theory is also used in cognitive development programmes, such as the Analytical Thinking Skills and Systems and Strategic Thinking courses.